Researchers recently discovered that menorahs prominently adorned Muslim coins and vessels during the early Islamic period 1,300 years ago. Relics inscribed with the Jewish symbol dating to the Umayyad dynasty during the seventh-eighth centuries were found at various archeological sites in Israel and are now being exhibited to the public. Last year, archeologists Assaf Avraham of Bar-Ilan University, and Peretz Reuven of the Hebrew University of Jerusalem exposed an early Islamic inscription referring to the Dome of the Rock as “Beit al-Maqdis.” Jewish-Muslim influences in early days of Islam According to scholars, the “Nuba inscription,” as it is called, implies that in the early days of Islam, Muslims perceived the shrine as an Islamic version of the Temple of Solomon. Now, researchers are exposing further finds in Israel that constitute evidence of Jewish influences in the early days of Islam. “The Jewish symbol which the Muslims were using was the menorah [the gold seven-branch candelabra from the Temple], which appeared on several coins and other early Islamic artifacts,” said Avraham on Wednesday. 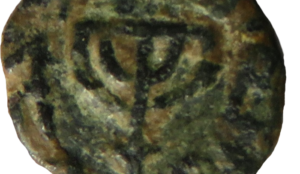 In addition to the coins, the archeologists are presenting several pottery and lead vessels from the early Islamic period that also utilized the menorah symbol in their design. “They are dated to the early days of the Islamic caliphate, and were in use by Muslims,” said Avraham, noting that the finds are of great importance for understanding the history of Islam….